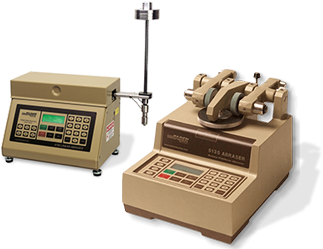 The TABER® Multi-Finger Scratch / Mar Tester - Model 710 is used to measure the relative resistance or susceptibility of a material surface to scratching, marring, gouging, scraping, engraving and other similar physical damage not classified as ordinary wear. Based on the apparatus described in popular automotive specifications, the instrument is commonly referred to as a five-finger (five-arm) scratch & mar tester and most often used to evaluate plastics. 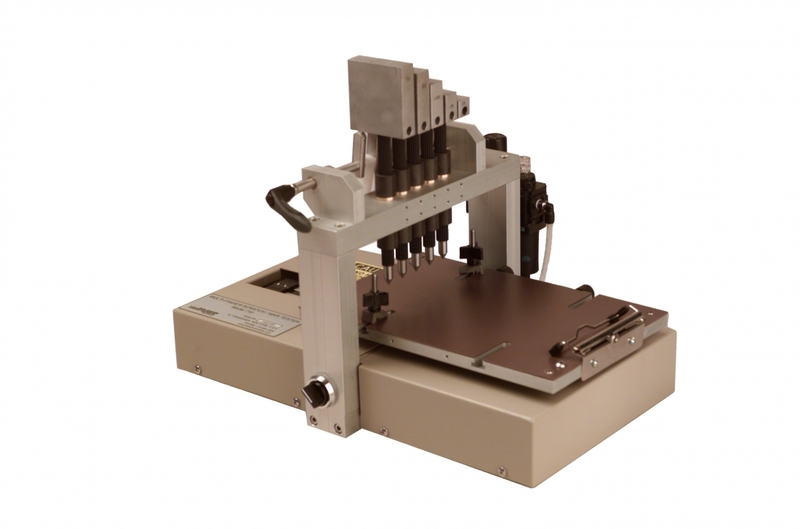 The Multi-Finger Scratch / Mar Tester includes a pneumatically driven, moveable platform to which the test specimen is mounted. The platform moves in a linear fashion, and is operated by a control knob for single or multiple pass testing. An electronic timer displays the rate of speed, which can be controlled by reducing or increasing air pressure. A gantry supports five independent splined-fingers, which provide a constant, vertical load on interchangeable scratch tips. The gantry system includes a handle to raise and lower the arms. In addition, five support rests are incorporated to allow one or more arms to be moved to an upright, rest position such that the arm does not contact the specimen during testing. Individual weights of varying loads mount to the top of each arm finger to exert a standard force on the surface of the test material. Each instrument includes a weight set of 2N, 3N, 4N, 5N, 6N, 7N, 10N, 15N and 20N loads. Optional weights sets are also available consisting of either 4N, 8N, 9N, 12N or 8N, 13N, 18N weights. In addition, an optional weight of 25N or Precision Weight Kit to achieve 0.6N loads are available. Although flat specimens up to 22mm thick are normally tested, the 'free-floating' arms fingers enable you test slightly contoured specimens provided they are rigid or adequately supported. A spring-loaded specimen holder is standard and can be mounted to the end or side of the moveable platform for greater flexibility. To mount contoured specimens, two specimen hold-down clamps are provided. An optional 5mm spacer set is available to raise the gantry to accommodate specimens that are greater than 22mm thick. Each Multi-Finger Scratch / Mar Tester includes a set of five 1.0mm diameter hemisphere Scratch Tips and 7.0mm diameter hemisphere Mar Tips. Both include a precision tungsten carbide ball mounted to the contact end. 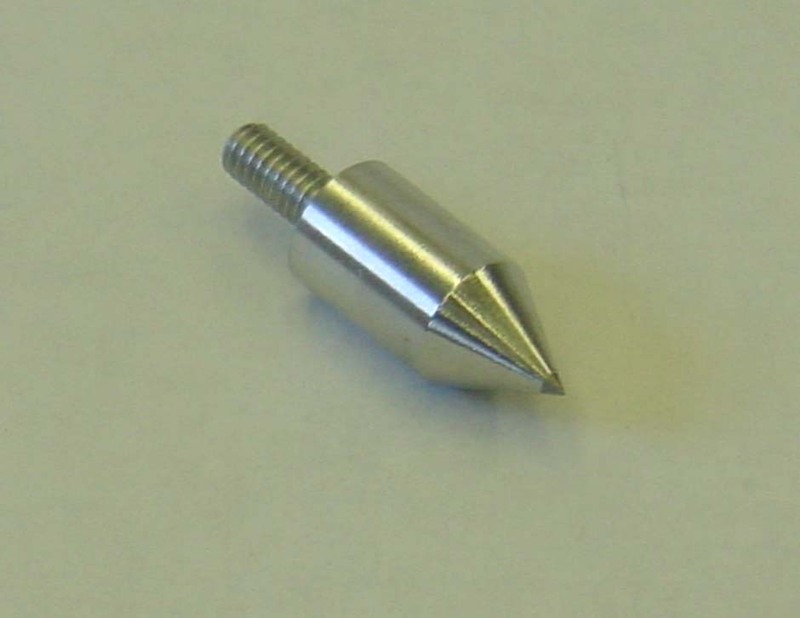 Optional conical scratch tips are also available in either tungsten carbide (0.1mm; 0.25mm; 0.4mm and 0.5mm diameter) or diamond (with 90° 3mil or 90° 3.5mil radius point). Visual Evaluation - For this technique, the observer uses a controlled light source to visually inspect each scratch line and rates according to a Rating Scale 1 to 5 (1 = no scratch line at all; 5 = severe scratch line). For plastic materials, indicate if the line exhibits signs of whitening. Width/Depth - Using an optical measuring device such as an Optical Micrometer, the operator measures the width and / or depth of the scratch. Image Analysis - Another option would be to use an Image Analysis technique such as SEM. NOTE: The properties of plastic materials can greatly influence the evaluation of scratch and mar resistance. It is important to be aware of the following factors and take them into consideration. For reproducible results, define if evaluation should occur immediately following the scratch test or after a specified amount of time (e.g. 24 hours). Many plastics have elastic recovery upon removal of applied stress. Many plastics have visco-elastic properties and the stresses in the plastics may relax during loading. Plastics may change structure during material flow, which can also change the mechanical properties of plastics. The following link provides a listing of test methods the Taber Multi-Finger Scratch / Mar Tester satisfies. Please note, additional accessories may be required.